Economic Confidence Highest in D.C., Lowest in W.Va.
Confidence declines in all states and D.C.
PRINCETON, NJ -- In 2011, Americans remained pessimistic about the national economy, but residents of the District of Columbia, North Dakota, Minnesota, and Nebraska were less pessimistic. Economic confidence was lowest among West Virginia and Maine residents. Nationally, the Economic Confidence Index was -37 in 2011, down from -28 in 2010. The Index is based on the average differences between Americans' assessments of current conditions (11% excellent or good and 48% poor in 2011) and their views of whether the economy is getting better (29%) or worse (66%). The Index has a theoretical range of -100 to +100, with negative scores indicating respondents are more negative than positive about the economy. 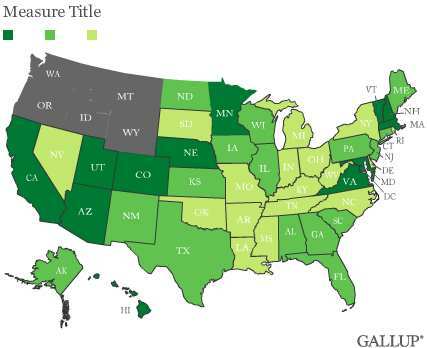 For the full results on the components of the index by state, see page 2. There are no clear patterns in the states that rank in the top and bottom 10 in economic confidence. For example, the top 10 states vary by region and political leanings, including the most (Hawaii, along with D.C.) and least (Utah) Democratic states. The composition of the 10 most economically confident states is similar to last year's, with Delaware and Texas the only states dropping out, and Utah and Nebraska moving in. After the District of Columbia, South Dakota and Hawaii had the highest economic confidence scores in 2009 and 2010, respectively. North Dakota ranked first in 2008. West Virginia has ranked as the least economically confident state in both 2010 and 2011. It was third worst in 2009, behind Wyoming and Michigan. Rhode Island was least confident in 2008. Economic confidence dropped in all states and the District of Columbia in 2011, reflecting the overall decline nationally. The declines range from a low of 3 points in Idaho and West Virginia to a high of 22 points in Delaware. In fact, Delaware's decline was steep enough that it fell from one of the 10 most confident states to one of the 10 least confident. Economic confidence is also lower in most states than in 2009, when the national average was -35. However, compared with 2008, when the national average was -48, most states' confidence scores are significantly better. Americans overall and in every state remain more negative than positive about the economy, creating a challenge for President Obama as he seeks re-election this year, given the strong relationship between economic conditions and an incumbent's re-election success. On a near-term basis, however, economic confidence picked up in January of this year, perhaps foretelling a more positive uptick to come in 2012. Americans are also substantially more confident about the economy now than they were in the year Obama was elected. Thus, it is not clear if voters will reward him for the signs of economic improvement that have come in recent years, or hold him accountable for the fact that the economy is still struggling nearly four years after he took office. Results are based on telephone interviews conducted as part of Gallup Daily tracking January 1-December 31, 2011, with a random sample of 174,639 adults, aged 18 and older, living in all 50 U.S. states and the District of Columbia. Margins of error for individual states are no greater than ±5 percentage points, and are ±3 percentage points in most states. The margin of error for the District of Columbia is ±6 percentage points. Americans' self-reported retail spending dropped by a predictable amount in January compared with December, as consumers pulled back from their elevated spending levels over the holiday season. Americans' confidence in the economy has been steady for the past three weeks, after improving slightly at the start of the year and following significant gains in late 2011. Confidence is now on par with where it stood last May. About half (49%) of Americans agree with President Obama's claim that the U.S. economic system is unfair, while 45% say it is fair. At the same time, 62% say the U.S. economic system is fair to them personally.